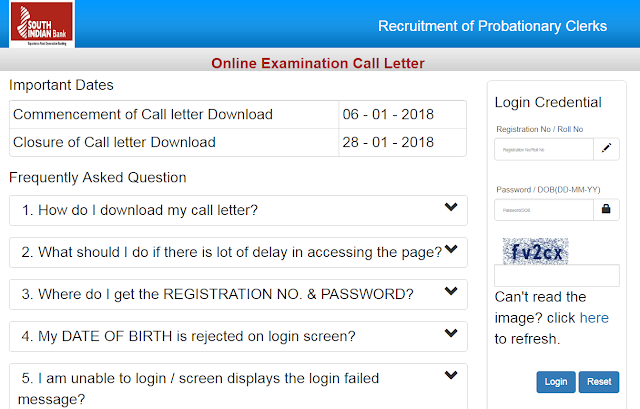 South Indian Bank Clerk Admit Card 2018 is out – Download Call Letter for SIB Clerk examination 2017-18 , check Important dates and hanout information. SIB Clerk Admit Card - South Indian Bank has released Officially Online admit card of its clerk recruitment examination 2017-2018, The SIB online test which is Schedule to be conducted in January 2018. The candidates who have applied for the SIB Clerk recruitment, can download his/her call letter from the Official south Indian Bank link mentioned below. All The best for South Indian Bank Clerk examination.